Now we are in Slovenia, just hours away from Venice. Venice, Slovenia and Croatia form a triangle near the Adriatic Sea coast. Slovenia was once a part of the former Yugoslavia which broke up in the 1990s after the war in the Balkans that killed thousands. But Slovenia requested and won independence from the Yugoslavian Federation in 1992 before the Balkan wars. World War II took the lives of thousands of Slovenians both by the Italians and the Germans. 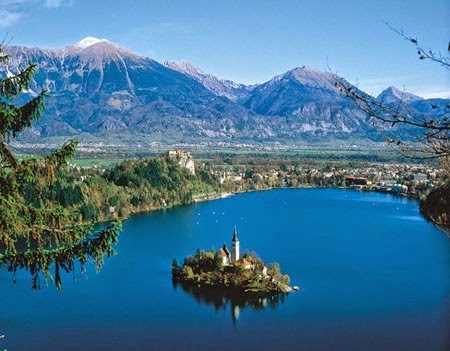 Modern day Slovenia is prosperous and full of opportunities for recreation and outdoor activities of many kinds. It's a small country with a lot of open space as well as mountains, lakes and rivers. Let's take a look at the gun laws in Slovenia. The rate of privately owned firearms is 13.5 per 100 compared to the U.S. 101 per 100 people- seriously. I didn't make that up. The rate of gun deaths in Slovenia is 2.44 per 100,000. Firearms homicides are .05 per 100,000 while the gun suicide rate is 2.34 per 100,000. There was 1 unintentional firearm death in 2010 in Slovenia. Private possession of handguns and semi-automatic assault rifles are strictly regulated and only allowed with special authorization. Licensing, registration and providing a good reason for the necessity to own a gun are required in Slovenia as well. Safe storage of guns and ammunition is also required. Oddly citizens in Slovenia are allowed to carry guns in public with no permit. For some reason, with only one unintentional gun death and just over 1 gun homicide, apparently Slovenians are more careful with their guns than gun owners in the U.S. And there is no gun lobby to ramp up fear and paranoia about gun rights. As with my other posts about gun laws in countries that I visit, there is an inescapable comparison to strong gun laws and few gun deaths and injuries. People are allowed to own guns but have to go through a process to get them that must make one think about their own responsibilities towards the firearms. I am looking forward to a peaceful and non violent trip to the country of Slovenia where common sense has worked to keep people safe from gun violence. Well obviously you're going to see more gun deaths in a country with more guns. You're also going to see more alcohol deaths in countries with a higher alcohol consumption. But by far the great majority of gun deaths are suicides. Suicides has no bearing or impact on public safety nor does it deprive the rights of other people's right to live. No matter how much you want it to be. These stats also say nothing about the violent crime rate in Slovenia. Adam- a simple check of facts will show that the overall crime rate in Slovenia is very low. http://www.inyourpocket.com/slovenia/Crime-and-Safety_73434c. At no point did we feel unsafe while there. As to your other assertions, they make no sense. Suicide has a bearing on loss of lives of loved ones. Strong gun laws will lead to saving lives and better public safety. No one's rights will be affected except those who should not have guns in the first place. We all have a right to be safe in,our communities from gun violence. "Ljubljana is one of the safest capital cities in the world, with the only prevalent crime being bicycle theft, which is unlikely to affect short term visitors. Nowhere in the city is unsafe to walk at at any hour, although if you're by yourself it's probably best to avoid certain parts of Tivoli Park in the middle of the night. The only real threat to safety in the city comes from out-of-control cyclists and negligent drivers not paying attention to pedestrians. Perhaps a secondary menace are slow-to-react automatic doors that seem to be installed in shops across Ljubljana - causing hurried consumers much grief and the rare minor injury. " At no point are these statistics regarding crimes in Slovenia. But I see your point. No suicide does not impede on the safety of others. When I'm talking about safety, I am referring to physical safety. Only the suicidee's physical safety is impacted. When I ride a motorcycle and get killed, only my physical safety was harmed. Not the community. Emotional and physical safety are two completely different things. You do not have the right not to be emotionally harmed, only physically harmed by others. This is why secondhand smoking is banned, and drunk driving. But not smoking in the privacy of your own home or getting drunk. In fact I can use your logic as an argument to ban abortion. I would argue that suicide is one of the most basic human rights there is. I have the right to a clean, quick and painless death at my own choosing. I don't agree with you. Suicides can't always be prevented. But why would we provide such an easy means to it in the form of a gun? The majority of suicides are by gun. Guns make it very final and are more effective. When people survive a suicide attempt by other means they often do. to try again. There is treatment for depression. Why not? And when a teen ager commits suicide over a relationship break-up for example, that is a final solution to a temporary problem and the families are devastated. We can prevent the loss of a loved one who could live a good life. I am not sure you find suicide listed as a basic human right. My husband's brother committed suicide. He was too young to die. It was devastating to up his family. Simple really. The freedom to make choices includes the freedom to make the wrong choices, including permanent ones. If smoking was banned, the 500,000 people that die to it each year would have gone on to live long and happy lives, Ditto for the 90,000 or alcohol deaths. Or practically any commodity. One of my closest friends was killed in a motorcycle accident. If he hadn't been riding a motorcycle and was in a car instead at that moment he wouldn't have died. Ultimately though, he knew the risks and chose to ride anyways. As I've said before, you do not forcibly prevent people from smoking. Even though smoking is pretty much never a rational choice, extremely addictive and almost always leads to very negative health consequences in the long run, people still have the freedom to make the wrong choice. You educate people about the risks, you do not physically dictate what they are allowed to do with their own bodies. I know that owning a gun carries a significant suicide risk, and I still choose to own one. It's not the right of anybody else or society to prevent me from killing myself one day anymore than it is from lighting a cigar in my own home, or riding a Harley. No one is saying you can't have your gun if you choose. But safe storage can prevent a very small child from accessing a gun and killing him/herself or someone else by accident. These types of avoidable desths happen every day. Often mass shooters are suicidal. Keeping guns from them if possible, and we can make it harder for them to get guns, can save innocent lives. We have established that those who smoke can't smoke inside because second hand smoke affects the health of others. My brother was an alcoholic but his doctor told him he would die if he didn't stop and get treatment. He did. We are all happy about that because he is still living amongst us. The teen aged son of a friend was left a life long paraplegic because he didn't wear his helmet and was in a motorcycle accident. Many years later the entire family is suffering. Why not practice prevention?